Older Single Mum: Guilty Pleasures - Listography Round Two. Guilty Pleasures - Listography Round Two. Honoured to be hosting #Listography here today! We all have secrets from our family, right? I don't mean the serious ones, I mean those little guilty pleasures that we indulge in, hoping no-one will catch us. This occurred to me the other day when I was hiding from the kids and the students, stood alone in the kitchen, contentedly popping Parma Ham out of the packet straight into my mouth. Not only could this be considered an outrageous luxury when it's possible to knock up a meal for the whole lot of us for the price of a portion of it, but there is no way I would willingly share a single slice should anyone happen to appear, so it's something only to be undertaken unbelievably furtively. Foolishly thinking that others' must similarly sneak stuff and that such solidarity would soothe my conscience, I invited confessions, which actually made me feel either pathetic - thanks to HPMcQ's bloodlust for the meat juices on the bottom of the roasting pan, or prim & properly sophisticated, thanks to Tired Mummy of Two's Ketchup, Salad Cream and raw onion sandwich fetish. Then Yellow Days contrived to make us all well jel with her secret soft spot - GIANT white Toblerones - which aren't even available in this country, so that's quite an epic guilty pleasure to covet and Sandy from Baby Baby admitted to not even getting home before tucking into hers, keeping a pack of disposable spoons in her car purely for the purpose of dismantling and eating the cheese bit from the base of specially bought cheesecakes! But just to put us all in our places, Kate Takes 5 waded in with a wonderful reminder of a whole Listography on the matter which stretches far further than food (she gets crushes on guyliner, for example - er, ew!) and so popular was this subject when she ran it over two years ago - collecting 60 other entries, each with their Top Five Guilty Pleasures, thereby granting us all a good exoneration, we decided to run a second one for those of us who missed it the first time and those whose have changed in the two years since or anyone else who fancies joining in really. Here are the details about what a Listography is and how it works, but, simply said, you just link up a post with your own list, usually and historically about whichever subject Kate has set her heart to on her blog, only on this particular occasion the Linky thingy is at the end of here. 1) Parma Ham. 'Nuff said. 2) Soya Lattes with hazelnut syrup when I should be at home doing stuff. 3) Gary Barlow now he's got stubble. 4) Microwaveable mashed potato for the top of Shepherds' Pies. 5) *whispers* The Daily Mail - mainly because the print is big enough without my reading glasses. So what would your Top Five Guilty Pleasures be? Stick them on a post and please link up to Mister Linky below. Jenny from the incredible Just Photos By Me and Cheetahs eats rice pudding out of the tin with golden syrup. Missie Lizzie - Betty Crocker fudge icing straight from the tub. This is progress, believe me (think custard powder!). Helen from The Crazy Kitchen - Peanut butter with a spoon (sometimes spread on a banana) and a cup of tea. Helen Neale - Jelly Belly Beans in a secret cupboard in the kitchen while cooking. Even the Domestic Goddesque does it - Marshmallow Fluff + Jar + Spoon. And Mummy Never Sleeps never sleeps 'coz she's eating Dairy Milk in bed. Aly from Plus 2.4 doesn't feel guilty about anything she eats but we all know she has got a thing about beards, while Amanda's got the healthiest one of all about beetroot with balsamic vinegar. Can you do better? Clear your conscience here! Thank you for hosting - enjoy the week! I was still saying guys who wear eyeliner but she brought me up to date! LOL! He's proving pretty popular! Oooh I never thought of microwaveable mash before: what an excellent tip! I am guilty of daily fail reading when I can't sleep! She's a bad influence, that woman! Sorry you're so poorly. He'd be worth it! Oooh I need to join in this week .... although should I really be keeping my guilty pleasures to myself!? Please do - and no! Looking forward to it now! Great taste Maggy on the first, not so sure about the last, but that's what this space is for! That's the best excuse for reading the Daily Mail I've heard! Gotta have a bit of fun! You've got me salivating now! 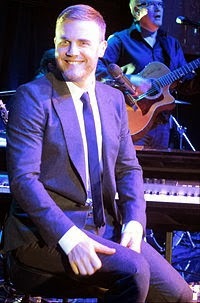 Oh my Gary Barlow *falls into a I loooove him stupor* I'd give up the beetroot for him! I'm feeling less guilty about Gary Barlow with each comment that comes in and more guilty about the Daily Mail! She's always one step ahead of the game! oooh, I do like Gary Barlow. My guilty pleasure is a big Latte! Only 5 now that is a bit of a challenge isn't it. Funny I just popped some ham into my mouth too lol. Yay! So pleased listography is back. My guilty pleasure is definitely bad teen TV series - like The Vampire Diaries. Great for watching when doing the ironing. I took part the first Guilty Pleasures Listography and am so chuffed to see that they just keep ona comin'! Glad to know I'm not the only one out there in Round 2 and good to see some new faces (welcome partners in crime) Like Pinkoddy I found it hard to stick to only 5, and it was a fine line between full on confession and reminding myself "no this is something you feel good AND guilty about... not the naughty things you do!" - perhaps another Listography theme? Haha! Parma ham - me too! I've eaten a whole packet of antipasto selection this week without even telling the kids it was there in the fridge! My secret guilty pleasure is having a hot chocolate with the kids as CBeebies winds down at 7pm; my girls don't know that there's a nip of whisky in Mummy's hot chocolate! Also: I am mad on the Twilight saga films... really not cool so I'm told. I joined the linky but it didn't show up - I guess you have to approve it. We so need a guilty secrets listography after this. Hi there :-) I have added my shameful list to the link! Last Christmas, I was so desperate for chocolate I ate a chocolate from my daughter's advent calendar. When it came to the fateful date, I told her that she must have made a mistake, and already eaten it. Tis not one of my proudest parenting moments, but at least it wasn't the Christmas Eve chocolate, although I was bloody tempted. LOL, I loved this! What makes it even funnier is that advent calendar chocolate is not even good!! But totally understand anyway. I've eaten chocolate from the kids' Halloween hauls and had to summon superhuman will power not to eat more than one so they wouldn't notice.